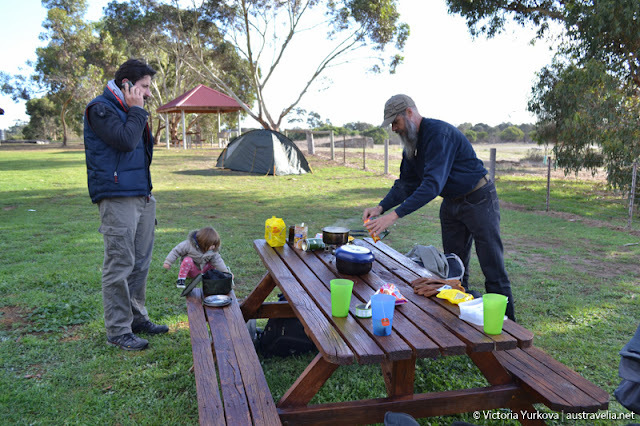 In the caves of the National Park Naracoorte we already have been several times. This time we did not plan to go underground, and just wanted to see how thousands of bats fly out of the cave to hunt at sunset. Unfortunately, because of the delay in the way we could not see this spectacular action, as we arrived at the park around 8 pm, in two hours after the sunset. 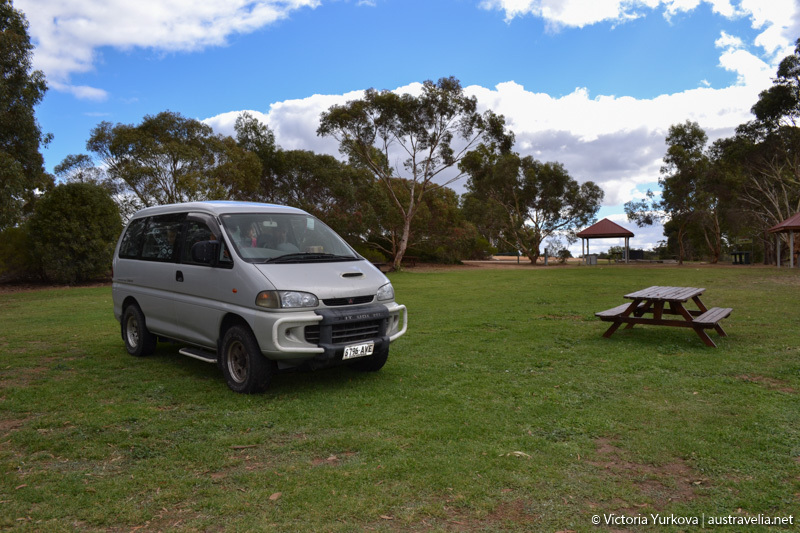 Wirreanda campground in the Naracoorte National Park is really pleasant and well-organized place. There are a place for the campfire, electric barbecue, tables with benches. We were especially pleasantly surprised by a comfortable restroom with shower, and consequently, with hot water. In addition, there was a small clean laundry, and a few orange trees near these facilities. We set our tents in the darkness, illuminating the campsite by headlights. At this time our children warmed themselves at the campfire, carefully left by neighbors who had already gone to bed. We roasted the meat on an electric barbecue, which worked perfectly, and then joined the children at the campfire. We enjoyed the campfire as well as a great cocktail from Port and Shiraz, heated on eucalyptus charcoal. On this night we celebrated Alex's Birthday, so there was also a traditional cake with candles. The night was very cold for April, the temperature dropped down to 0oC. In the tent it was as cold as it was outside. 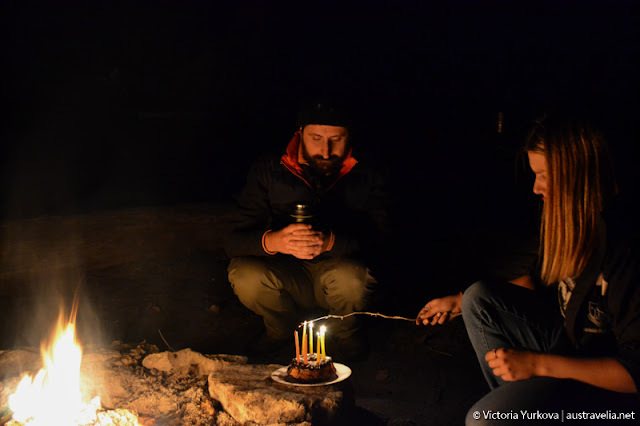 Our sleeping bags were not designed for such a temperature, so we had to put on all warm clothes and turn on for a while a portable gas stove inside of a tent. 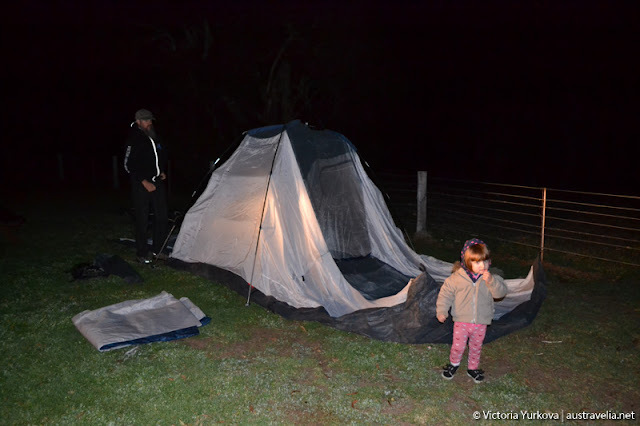 Children offered to move the tent to the restroom, where it was much warmer. Before dawn it became warmer. The morning sun began to warm the tent as a greenhouse, even though it was still cool outside... Our friend Victor woke up first and had a walk around the campground. He luckily took some pictures of kangaroos surrounding the site. Suddenly we heard the distant sound of gunfire, and saw a few dozen of kangaroos bouncing from the hill in our direction. We were very puzzled by this. Later, the ranger explained that there were not the shots, but whips clicks. 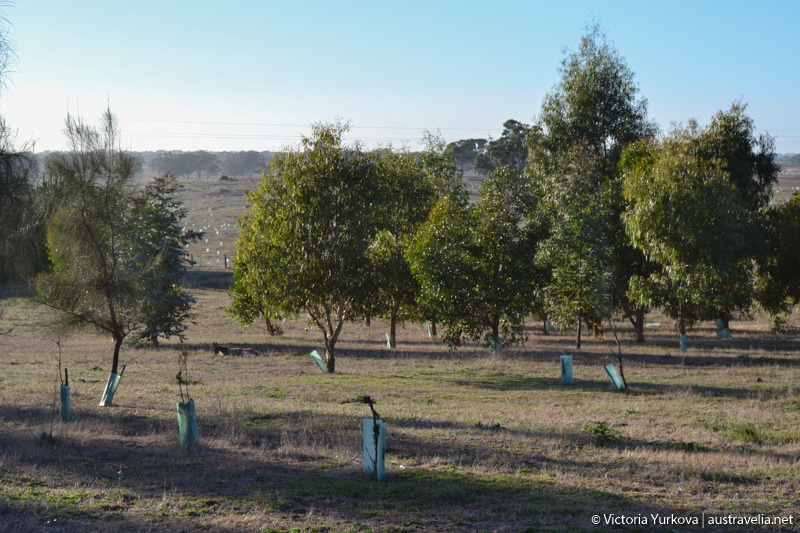 Thus local farmers every morning chased away the impudent kangaroos. When we were ready to go, it turned out that the car did not want to start. Apparently, even when you have a dual battery, using headlights as a torch is unreasonable. Especially because these batteries have lived for many years. We had to contact the roadside assistance (RAA). The Road patrol arrived really quickly, and started our engine by a small magical battery (the size of a 1/3 normal battery). He said that it was the 10th diesel in that morning, which did not want to start. Actually, the night was too cold. We were afraid that after such a freezing night children may catch a cold. However, we decided to continue the journey, but to spend next night in a cabin in a Horsham Сaravan Park. Было здорово! Как и всегда в путешествиях с хорошими друзьями!